In 1951, Constantine Saradakis entered the monastery of Prophet Elias not far from his village. In that monastery, besides the abbot there labored two elderly, blind monks, whom the young novice served with great love. Three years later Constantine received the monastic tonsure with the name Sophronios. In 1954, Monk Sophronios was recruited into the army, as was mandatory according to Greek laws of the time. Just as in the monastery, in the army the young monk did not disdain to do any kind of work, showing respect and obedience to his superiors, but at the same time trying to fulfill his monastic duties as well. But in the army Fr. Sophronius was hit by a great temptation, accompanied by demonic attacks—he got a fever that would not go down despite all the doctors’ efforts. 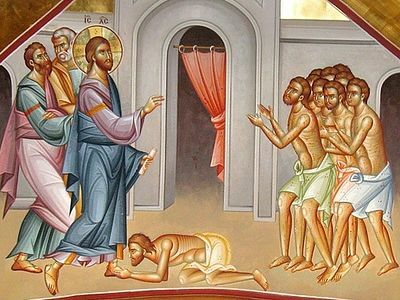 The drafted monk was transferred to Thessalonica in serious condition, and there they found the terrible cause of this strange illness: leprosy! Thanking the Lord for this heavy cross, the sick monk was taken to the Athens leprosy hospital, where fortunately the treatment was successful and he completely recovered. But having tasted the bitter taste of that terrible illness, he decided to remain in the leper colony and serve the suffering. And there were over 500 of them in that hospital! The hospital administration gave the monk a small hut near the hospital church dedicated to Sts. Cosmos and Damian. It was here that the elder spent the rest of his life. The monk spent his days in the leper colony in spiritual ascetic labors, in care for the bed-ridden lepers, and in church services. It was a great blessing for Fr. Sophrony to meet St. Nicephoros the Leper, who was infected with leprosy while still very young and lived for forty-three years in the leper colony on Chios. In 1957, St. Nicephoros, by then blind and nearly paralyzed, was transferred to the Athens leprosy hospital. Until his repose in 1964, St. Nicephoros was Fr. Sophrony’s spiritual guide, and the latter took care of the saint with great love until the end of the saint’s days. In 1975, the forty-four-year-old monk was ordained a priest with the name Eumenios and became the father confessor to the leprosy hospital, which became a hospital for acute infections. Having lived more than a half century in his humble hovel in the hospital yard, the elder ceaselessly served God and people—hearing confessions, serving at the holy altar, consoling, giving advice in complicated situations, working miracles and healing both spiritual and physical illnesses. Despite the serious illnesses that he also suffered, a smile never left the elder’s face, and boundless love for God and all people shone in his eyes. According to eye-witnesses, clairvoyance, working miracles, and seeing the saints were all ordinary business and par for the course for Fr. Eumenios. Generously endowed with grace-filled gifts of the Holy Spirit, the elder “hid himself” successfully behind the walls of the hospital. St. Porphyrios of Kapsokalyvia, who sometimes went to Fr. Eumenios for confession, called him a “hidden saint of our days”. After the fall of the communist regime in the USSR, Fr. Eumenios and his spiritual son, now Bishop Neophytos of Morphou (Cypriot Orothdox Church), made a pilgrimage trip to Kiev, Moscow, and St. Petersburg, where with great reverence he venerated the holy tomb of Holy Righteous John of Kronstadt. After returning to Athens, the elder’s health problems worsened: diabetes, weak vision, kidney problems and problems with his legs, which the doctors proposed to amputate. Battling against death over the next few years, the elder never interrupted his pastoral service of receiving a never-ending stream of people. In 1992, for his service to the Church, Fr. Eumenios was awarded the rank of archimandrite. In 1999 the elder was hospitalized in the “Evangelismos” hospital in Athens, where on May 23 he gave his soul into the hand of God. The blessed elder’s body was buried in his native village of Efia. In our days, at the prayers and intercession of the blessed elder Eumenios, the Lord works a multitude of miracles of healings and spiritual consolation for the sick and suffering. 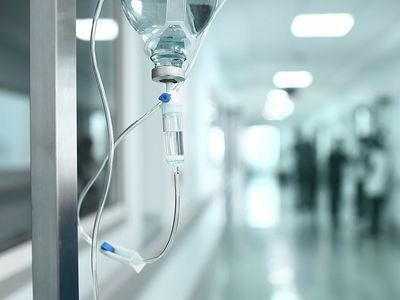 The hospital is a special place, where it is not always so easy for a priest to get in and “blend in with the scenery” when his priestly duties call him to the bed of a patient.